Once per turn, Guan Lu can ask any player to do a judgment. If it is a spade, they must discard two cards. If it is a heart, they recover one blood. If it is a club, they take two damage. If it is a diamond, they draw one card. 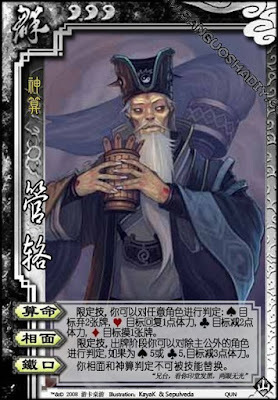 Once per turn, Guan Lu can ask any player besides the king to do a judgment. If it is a black 5, they lose three blood. Other powers cannot influence these judgments. The two powers are done with separate judgments and done at different times. So Guan Lu can ask player to perform the judgment for "Fortune Telling", and then ask them to do another for "Physiognomy". Guan Lu must tell the target which judgment they are performing before they flip the card. No powers can be used to influence either of these powers. Neither Sima Yi, nor Zhang Jiao, nor anyone else can get any influence.